This landmark collection of essays by Third World activists highlights two major world changes which, they argue, have been neglected by Freire and his many followers: the Third World grass-roots cultural resistance to economic globalization, and the ecological crisis. One source of the activist-authors' criticisms of Freire's pedagogy is rooted in their attempts to combine consciousness raising with literacy programs in such diverse cultural settings as Bolivia, Peru, India, Southern Mexico, and Cambodia, where they discovered that Freire's pedagogy is based on western assumptions that undermine indigenous knowledge systems. 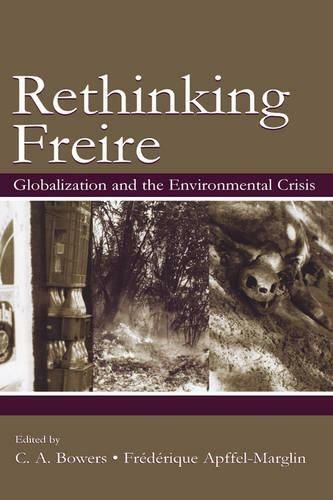 Equally important, these authors make the case in various ways that a major limitation with Freire's ideas, and which is reproduced in the writings of his followers, is that he did not recognize the cultural implications of the world's ecological crisis. Several essays in the collection focus directly on how the cultural assumptions Freire took for granted were also the assumptions that gave conceptual and moral legitimacy to the Industrial Revolution--and continue to be the basis of the thinking behind economic globalization. The essays also explain why cultural diversity is essential to the preservation of biological diversity, and how intergenerational knowledge and patterns of mutual aid within different cultures provide alternatives to a consumer dependent lifestyle. In his Afterword, C.A. Bowers addresses the need to adopt a more ecological way of thinking--one that recognizes the many ways the individual is nested in the interdependent networks of culture and how diverse cultures are nested in natural systems. It also stresses that one of the tasks of educators is to help students recognize the patterns and relationships of everyday life, and to assess them in terms of their contribution to less consumer dependent relationships and activities. As the essays in this volume affirm, this involves facilitating students' awareness of differences between cultures, the impact of consumerism on ecosystems, and the connections between hyper-consumerism and environmental racism and the colonizing relationship of the South by the North. Re-Thinking Freire: Globalization and the Environmental Crisis is a major contribution to this critical endeavor.